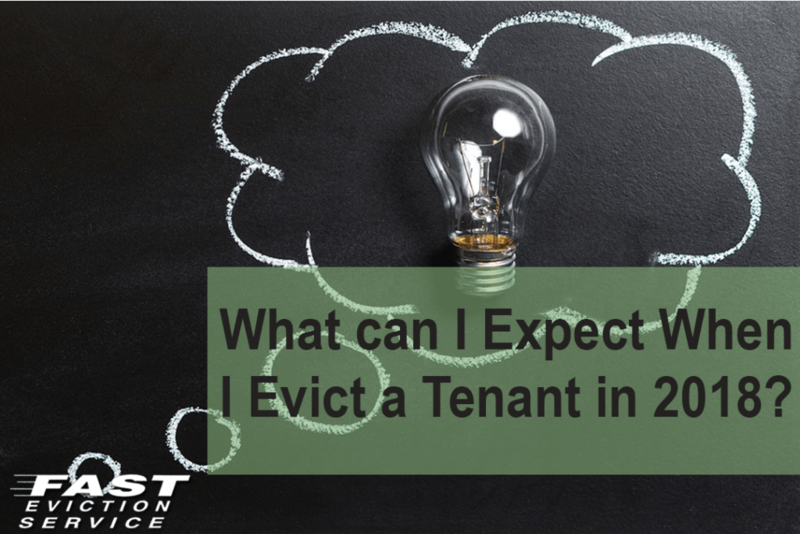 What can I Expect When I Evict a Tenant in 2018? If you recall about four and a half years ago, the Los Angeles court system did a sweeping overhaul with the unlawful detainer courts and closed many courthouses due to budget deficits. The eviction process that years ago took about 30 days for a uncontested eviction now takes at least 45-60 days for an uncontested eviction. A contested case takes much longer especially if the defendant has hired an attorney and requested a jury trial. Initially, the county of Los Angeles downsized their eviction courts from 25 courts to a 5 courts. About three years ago, they opened up two courthouses, Van Nuys and Norwalk. They recently in the past few months opened up three more courthouses in Inglewood, West Covina and Compton. What will this mean to you as a landlord? We would hope that the eviction process will move faster but unfortunately that does not appear to be the case. Your eviction is still taking longer. Why is that? Well for starters the majority of cases are now contested. Most tenants are sophisticated enough to file and answer and delay their case or they hire a paralegal. In many courts there are legal aid and self help counters to assist the tenant in contesting their case. Trials are also taking much longer and many times are not resolved on the date of trial especially if there is a jury or an attorney on the other side. On a recent day in Los Angeles court there were 56 cases in downtown LA. Out of those 56 cases, at least two thirds of those cases had an attorney representing the tenant. Because there is an attorney on the other side, your matter will not be heard in the main courtrooms in Santa Monica, Van Nuys, and Los Angeles. The matter will be sent to Department 1 downtown and will be heard in another courtroom or even courthouse.! If it is a jury you have to request the judge in Downtown LA for a “firm” date and the judge has to go over all your joint jury documents before you can be sent out to a courtroom for a jury. All of the defense counsel know that there are delays with a jury trial and for that reason many tenants attorneys request outrageous amounts to settle the case and or for relocation expenses. Especially if the property is under Los Angeles Rent Control. Further, expect the tenant to request to have the record sealed. Many defense attorneys will go to jury just on this issue. When you are in Downtown LA court, the judge in Department 94 even advises the tenants that if you are going to settle the case try to get the record sealed so it doesn’t go on your record. Once you get a judgment there are still further delays with the Sheriffs posting properties and performing the lockouts. On many of our cases there is about a month waiting time from the date you submit the writ to the sheriff until the lockout date of the property. What has happened in other counties? In Orange County, the courts switched over to electronic filings. This means that we cannot file any paperwork in Orange county court , rather we have to submit it to a third party vendor digitally. For any document, there is at least a 24 to 48 hour processing turn around on any filings thereby delaying your case. The more astonishing aspect of electronic filings in Orange County is that they do not require the defendants to electronically file; rather they are providing court staff to accept their filings over the counter! In San Bernardino County, originally they closed courts at Big Bear, Barstow, Needles, Chino and Twin Peaks. However they reopened Barstow a couple years ago. Out of all of the courts that I do evictions in I would have to say Fontana court in San Bernardino is the quickest. However, recently there have been a surge of Los Angeles attorneys representing tenants and requesting jury trials in San Bernardino and Riverside counties. This will delay everything by at least a month because the matter will be transferred to the central court in that county. They will set status conferences and final status conferences giving your tenant at least another month to stay and live for free. In San Diego County, the remaining courthouse that hears unlawful detainers is San Diego Central. The San Diego courts also use electronic filing. There is a 24-48 hour turnaround on getting any filings back which delays your eviction. San Diego is also impossible to get motion hearing dates and or exparte dates. If you have a problem case with an attorney who files a demurrer or another motion, it is difficult to advance the date because of the unavailability of courtroom clerks to help you and or hearing dates. Bottom line, there are delays in the processing of your unlawful detainer. The trickle down effect will be that your judgments will be greater because the tenants will be allowed to remain at the property for free for longer. The hope is that an uncontested case will not take more than 60 days from start to finish. As to contested cases it could take three to three and a half months to complete your eviction. The moral of the story is that the process isn’t getting any better and unlikely to change in the near future.